** Three of the Sunflower League's staple head coaches -- Free State's Bob Lisher, Lawrence's Dirk Wedd, and Olathe East's Jeff Meyers -- have yet to win state titles as head coaches. The trio have a combined 341 wins and 53 years of head coaching experience in the Sunflower League. You just get the feeling one of them is going to break the drought in the next few years. 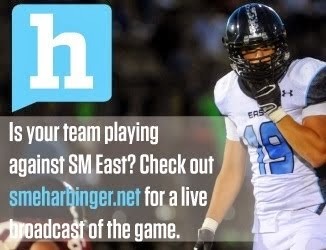 **It's a bit surprising that SM East defensive end Kyle Ball hasn't received any FBS offers to date. The 2013 Sunflower League Defensive Player of the Year is coming off a season where he recorded 107 tackles (28 for loss) and eight sacks. Ball, who stands 6-foot-2 and weighs 235 pounds, also had stellar performances at the summer camps of various local universities. He reportedly logged a 4.58 forty at Iowa State's summer camp in June, and he was, according to many reports, the most impressive defensive lineman in attendance at Kansas' summer camp. Widely regarded as the most tenacious returning defender in the state, I'm sure Ball will eventually land an offer(s). Especially as his senior production backs up what he's done the past two years with the Lancers. **There will be several content changes to The Sunflower League Football Blog this upcoming season. For one, I've done away with the the Weekly Player Ratings section. It was fun to keep tabs on which players were performing the best on paper, but overall I don't think it was the most efficient way to evaluate the league's top talents. And there was no real way to track lineman or strictly defensive players in the ratings. But I've also balanced things out by adding content. I plan on having weekly commentary overviews, such as this, in addition to more columns. I will also try to incorporate JV, Sophomore, and Freshman level team reports, where I see fit, if possible. **Is there anything like Friday nights in the fall? Pregame tailgates. The band's drumline echoing throughout the parking lot. The changing leaves and temperatures creating the unique fall ambiance. The smell of the popcorn as you enter the stadium. The unbridled rush of enthusiasm from the crowds. The synopsis during the car rides home. Post-game celebrations with friends. Re-watching the highlights that night on TV... Enjoy the football season. Open Scheduling: The Sunflower League coaches and athletic directors made the bullish move of allowing open scheduling in week one, and the result is more enthusiasm around opening week than we've had in years. Not only has this created more intrigue and excitement for the players, students, parents and fans, but it will also open the league to more exposure and potentially nationally televised games in the future. FBS Recruiting: The Sunflower League will feature at least three FBS-bound seniors this fall -- Scott Frantz (Free State, committed to K-State), Josh Moore (Olathe North, committed to Ohio State) and Marcel Spears (Olathe North, committed to Iowa State), not to mention two juniors in Isaiah Simmons (Olathe North) and Amani Bledsoe (Lawrence) who already hold multiple FBS offers. More top-flight recruits means better competition, which means better play on the field, which means more college coaches will be in attendance this fall and in the years to come. Turnovers and rushing yardage: This statistic shouldn't come as a shock to anyone who's been around Kansas high school football for any length of time, but in order to do well in 6A, you need a dominant rushing attack -- more specifically, a dominant running back. Since 1998, every Sunflower League team who's won a 6A state title has had a running back on their roster who rushed for 1,500 yards or more. Turnovers are also an excellent gauge for the slings and arrows of a team's fortunes. The past two seasons, the four Sunflower League teams who've made it to Sub-State have on average forced two turnovers a game. The classic Sunflower League scheduling structure: For the first time in history, Free State and Lawrence won't face off the in City Showdown in districts. Instead they'll play in mid-September. Due to the influx of 6A East, Free State will be competing against 6A West teams in districts and in the playoffs if they qualify. Lawrence will remain in 6A East. The 6A East structure, which has been predominately Sunflower League teams, will now feature six non-league teams in 2014 -- Blue Valley, Blue Valley North, Blue Valley Northwest, Gardner-Edgerton, Harmon, and Wyandotte. Oh, and Leavenworth will be playing in 5A, marking the first time since 2005 a Sunflower League team has not played in 6A. Dynasties: Class 6A tends to run in dynasties. From the late 1970s through the mid-1990s, Lawrence was the dynasty. Olathe North took over in 1997, and milked a dynasty through 2004. Hutchinson surfaced in 2003, and won seven state titles (six in 6A) in the eight years that followed, but the departure of head coach Randy Dreiling has seemingly opened things back up. So naturally we might be looking to the Sunflower League for the next dynasty. But I'm sorry, this isn't your father's or older brother's Sunflower League anymore. The coaching staffs are stacked, teams are more competitive, there are fewer punching bags, and there's no true "bully on the block." The evidence is in the fact the past three state title representatives from the Sunflower League have combined to go 14-13 in the seasons that followed. The Eagles begin their "Drive for Nine" with a trip south to take on Rogers (Ark.) Heritage. Anything less than a comfortable victory and the naysayers will be out in full force. The Lancers made headway as a program last fall making the 6A state title game, but mopping up what will be an inexperienced Gardner-Edgerton team would be yellow tape to the rest of league and state. The Hawks' opponent, Garden City, will be playing on the heels of a six-hour bus ride. 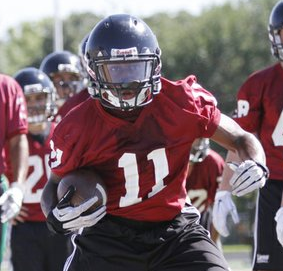 Olathe East can make its presence known with a what should be a solid home showing. Traveling to play Blue Valley West will be unfamiliar territory for the young group of Chesties. New stadium, new opponent -- but this group of Lions is ready to prove themselves after going 3-6 in 2013. Maybe the best thing about a Bob Lisher coached football team is they don't seem to miss a beat from one season to the next, especially on offense. Expect their zone-read to be at mid-season form. The Vikings will be bringing out one of their most inexperienced teams of the last decade. The good news is the newbies have chance to be very good; the bad news is the newbies are newbies. If SM South is going to break their string of losing seasons (which dates back at least 16 years), this week one matchup with SM North is a must-win kind of game. The Ravens, like their neighbors to the east, will be hosting a travel weary opponent in Hays. Whether they can or can't capitalize on those circumstances will be a sign of things to come in 2014. The Pioneers might as well think of the six games leading up to district play as preparation for 5A football. This week one game against Great Bend will be their only taste of 5A in that time frame. The Cougs have the most difficult week one draw of any team in the league as they host the defending Class 5A champs Blue Valley. But I respect the heck out of them for scheduling the game. The Indians haven't tasted a victory since week eight of 2011. Their current 19-game losing streak is two short of the 21-game streak set by Leavenworth in 2010 which is longest streak of its kind in the league since 2000. They need a win. Don't forget to join the Pick 'Em group on the message board! There's still time to make your picks! I'd prefer people to make accounts before picking.